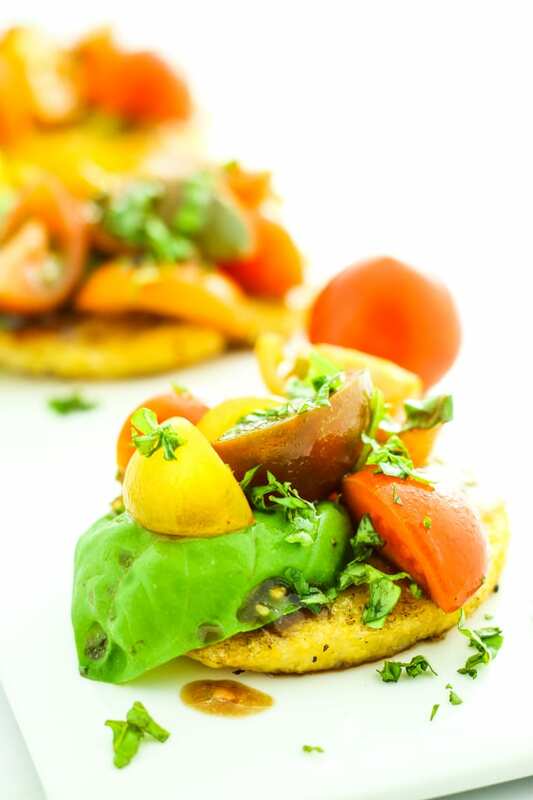 This grilled polenta bruschetta recipe is simple summer food at its finest. 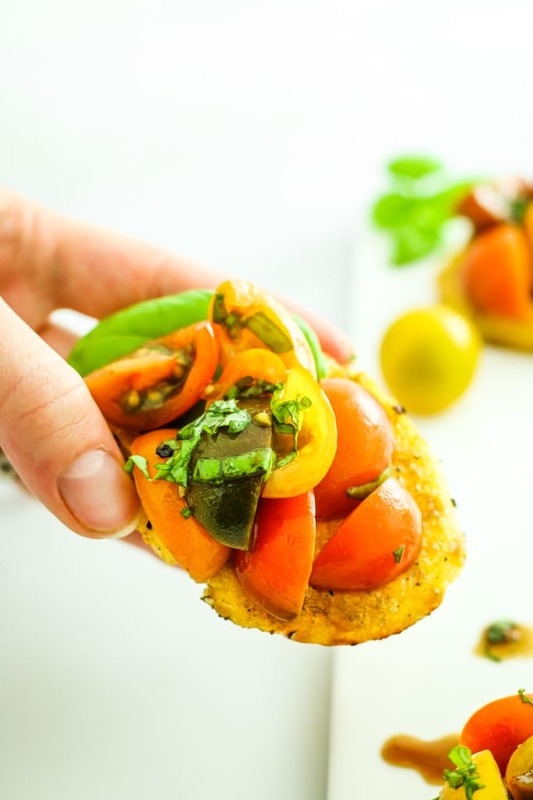 Topped with fresh marinated tomatoes and chopped basil, this makes the perfect appetizer or snack. And when I say fresh, I mean fresh out the garden. Those right off the vine tomatoes and some just-snipped basil. Unless you’re like me and you didn’t plant a garden this year because life was too damn crazy for that.  Hey, we can’t do it all… right? I used to think that busy was just a word that people threw around. Something to get them out of obligations they weren’t interested in. Or something to fill the space in a small talk conversation. But I get it now. Busy is launching a new website design and a new section of your blog. Busy getting an extra job at a tattoo shop to save $$$ for travel. Busy is making an unexpected trip home to watch your parents sign papers on the sale of the business you grew up in. Busy is having a 5-year anniversary trip planned to Mexico and moving to a new place the day after you get back. Busy is getting on a plane a few days later to go home for a wedding. Busy is getting home from work and literally not wanting to talk to any other person for at least 24 hours. Busy is not having time to go camping when you live in what is basically the camping capital of the United States. I’m not complaining, but I am definitely ready for a slow down. So that lands me here, somehow, talking about bruschetta. But not just any bruschetta. No, this is bruschetta built on slices of grilled polenta for that sweet corn flavor. 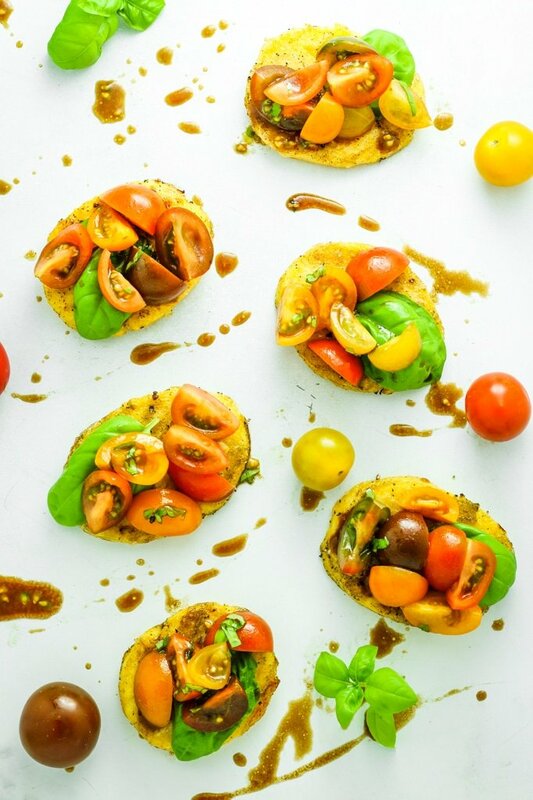 Bruschetta made with the freshest, most juicy and colorful tomatoes. This is summer’s bruschetta. Slow food at its finest. Slicing the tomatoes and letting them marinate in olive oil, salt, and pepper. Searing the polenta to get those grill marks just right. Soaking in the scent of the fresh basil. Summer. If you need me, I’ll be sitting in a camping chair on our “patio” (because we don’t have patio furniture yet), eating this polenta while sipping on a glass of rosé. Remove polenta from the packaging and slice into rounds about 1/2″ thick. Brush lightly with oil and sprinkle with salt and pepper. Place polenta slices on the grates and grill for 8 minutes per side. While polenta is grilling, make your tomato topping! 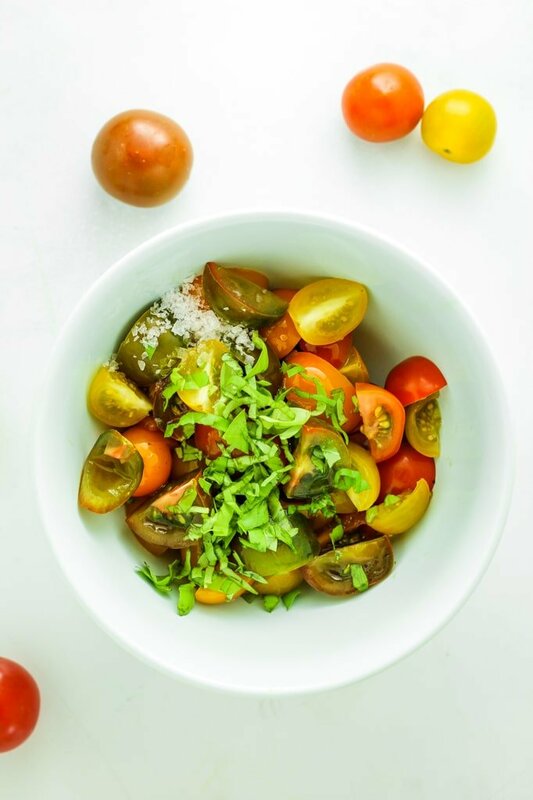 Combine tomatoes, basil, olive oil, balsamic, sea salt, and pepper in a small bowl. Mix together and set aside to marinate. 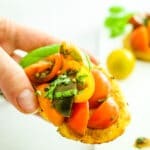 Remove polenta slices from the grill and spoon bruschetta topping over top. If desired, garnish with another dose of fresh basil. Sounds yummy! I planted heirloom tomatoes this year and they are doing quite well. The Sun Sugar cherry tomatoes are awesome!